"I've come here personally, as the leader of the world's largest economy and the second-largest emitter, to say that the United States of America not only recognizes our role in creating this problem, we embrace our responsibility to do something about it," Obama told a packed hall of presidents, prime ministers and leaders from around the world. The U.S. posture is critical going into two weeks of climate negotiations where leaders hope to emerge with a new international accord to slash greenhouse gas emissions. For the most part, activists and other leaders gave Obama high marks for his message of determination. "One of the enemies that we'll be fighting at this conference is cynicism, the notion that we can't do anything about climate change," Obama said. "Here, in Paris, we can show the world what is possible when we come together, united in a common effort and by a common purpose." He pledged a risk-insurance initiative that will be detailed tomorrow to help island nations cope with the current impacts of climate change, and he said the Paris deal should "make sure that these resources flow to the countries that need help preparing for the impacts of climate change that we can no longer avoid." The speech came amid a flurry of high-profile announcements. Obama met with Chinese President Xi Jinping ahead of an opening ceremony, where the two issued a joint statement calling for an "ambitious and successful" deal. Later in the day, he met with Indian Prime Minister Narendra Modi and said in remarks after that the Paris deal "must recognize and protect the ability of countries like India to pursue the priorities of development, growth and poverty eradication." Still, he said, "it also has to reflect serious and ambitious action by all countries to curb their pollution." The three leaders of the most energy-hungry nations then unveiled a major new initiative with Microsoft co-founder Bill Gates. The "Mission Innovation" will see those nations and 17 others double their research and development budgets while Gates and other billionaires will put money toward cooperative projects. 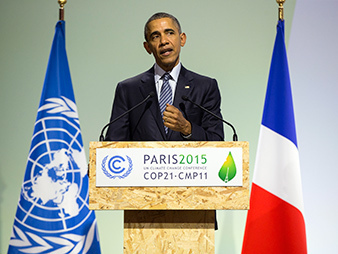 President Obama addresses world leaders at U.N. climate talks in Paris. Photo by Evan Vucci, courtesy of AP Images. Activists here gave Obama praise, though many said they were also cautious about the details of the insurance plan. Kumi Naidoo, executive director of Greenpeace, called it "welcome" but not a substitute for helping islands address the losses and damage they face. "This money is not the United States doing an act of charity or an act of goodwill," he said. "We would see it as a payment of their carbon debt. It is important that it's seen as compensation and redress." Sam Smith, who leads the World Wildlife Fund's climate and energy initiative, said Obama overall sent a message that the world needs to hear from the United States. "It's clear that at least on the framing he very much sees this as an effort on behalf of future generations, and so do we," she said. Speaking closely after Obama, Xi reiterated a pledge to peak emissions by 2030 and vowed to make climate change a central part of China's next five-year plan. "We should create a future of win-win cooperation," he said, adding climate negotiations should not be a "zero-sum game." "All eyes are on Paris," he said.